Fire and life safety systems are designed to offer security and give you peace of mind knowing that you, your employees, and your assets will be protected in a fire emergency. You want to be confident they will work if that crucial time comes. 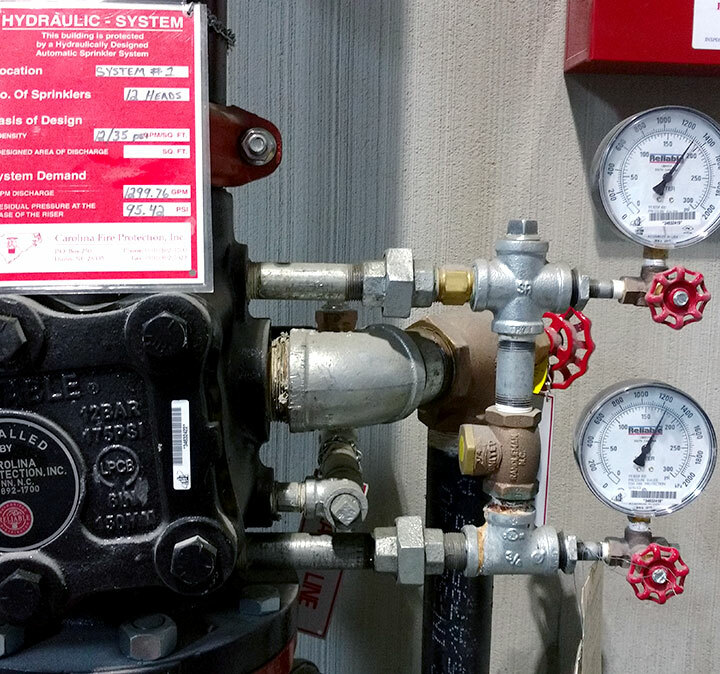 Carolina Fire Protection, Inc. can be trusted to ensure the integrity of your system by providing full fire sprinkler system inspection services and quarterly flow tests for your home or business. Our quality inspectors are here to conduct thorough and comprehensive examination and testing of your system so it will operate as designed, meeting and complying with the most current NFPA 25 standards, as well as federal, state, and local requirements. We remind you of upcoming inspection and testing deadlines, while providing regularly scheduled quarterly, semi-annual, and annual inspections that will work around your schedule. If deficiencies or recommended improvements are noted, we will give you detailed information and offer knowledgeable and cost-effective suggestions, as well as options for repair if necessary. Inspection results are emailed to our customers, and through our Building Reports Software, you can download your inspection reports online. To access your inspection reports, go to the Customer Login, located at the top right of the screen. Carolina Fire Protection’s online inspection and compliance reporting tool, Building Reports, provides the most trusted fire, life safety and security inspection and compliance reporting solutions in the world. It provides our customers with immediate, real time accurate information and inventory log to monitor the status of your fire system inspections. It provides our customers with a simple, easy to access database on Inspection Reports for 5 years anytime, anywhere. It will provide to our customers any warranty and recall notifications via an alert. It will provide a report that displays all devices which are labeled and electronically scanned at time of inspection. The reports will assist with code officials and ensure you have the proper documentation necessary to comply with state, local and NFPA regulations. In addition, Carolina Fire Protection, Inc. offers testing for backflow devices that ensure your water supplies remain protected from contamination or pollution. Our customer service doesn’t stop there. We keep up to date and complete service history files specific to you or your business so that you can be sure your records and documentation will always be available if you ever need to supply fire officials with the necessary information they require. When you let our competent professionals at Carolina Fire Protection, Inc. provide you with your ongoing inspection and testing services, coupled with our outstanding maintenance and repair service, you can be assured of our dedication to providing you with top-notch performance and the highest quality customer service.